To talk more about getting dental implants in Monroe NC with Dr. Mjahed request an appointment. Dental implants were invented in the 1950s by a researcher in Sweden named Leonard Linkow. These dental prosthetics have evolved over the years. Gone are the days of metal implants and clunky removable dentures. Patients now can enjoy the sleek, natural look and convenience of dental implants. What are dental implants and who needs them? Dental implants are an artificial tooth root that is inserted into the jaw where a patient has suffered tooth loss. A great alternative to dentures, dental implants are a permanent solution and are cared for in the same way as natural teeth. There are two types of dental implants. Dr. Mjahed at Monroe Family Dentistry can help you select the right one for you. 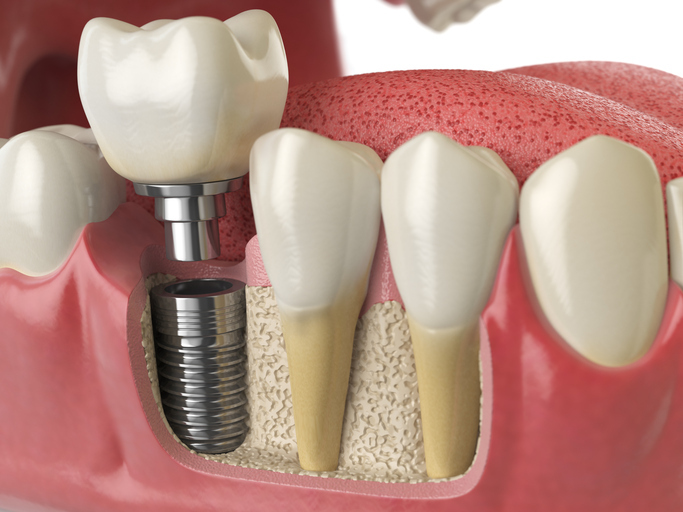 The first type of dental implant is placed on the bone using a metal post to keep it stable. Patients who cannot wear traditional dentures or do not have healthy bone structure will usually receive dental implants on the bone. The second type is placed into the jaw bone. This option is often for patients with extensive tooth loss. These full mouth dental implants help serve and support bone health. The implant-supported full bridge will integrate with the jawbone. This outpatient dental procedure is performed at our dental practice and it is implemented in stages. Step 1 Removal of damaged tooth or teeth. Step 2 Jawbone is prepared for surgery and the metal posts are inserted. Step 3 Healing time will last a few months. Step 4 An extension of the metal post is applied. Step 5 Once tissue around the application site heals, the implant tooth will be applied. The dental implants process can take a few months from start to finish. Contact us about dental implants in Monroe, NC, call us or submit an appointment request.